There are tons of things to see around Városliget, so your Budapest beer bike experience will be a long day. Start at the very heart of the park, right at the pond, to see the showcase of Hungarian architecture from a unique perspective. 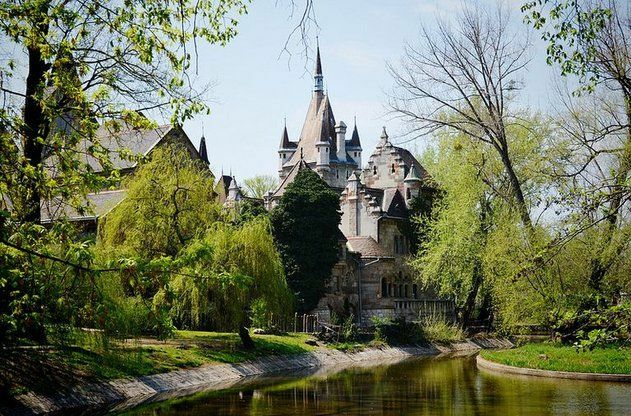 The so-called Vajdahunyad fortress is not an original castle, it was commissioned for the 1896 millennial year of Hungary. The buildings display the many faces of architecture from Gothic to Baroque. Just enter through the main gate to get a peek. If you’re a fan of nature and lover of animals, head straight for the Budapest Zoo. The lavish building is located right next to Városliget, you can’t miss it. Founded in 1866, as one of the oldest zoos in the world, the park has a rich collection of animal and plant life from all corners of the planet. Leading Hungarian architects of the 19- 20th century designed the buildings, so you won’t be disappointed in the view. An iconic building of Budapest is the Széchenyi Bathhouse, a symbol of the rich thermal bath culture in Hungary. Városliget’s busiest spot, the bath is one the most elegant of its kind in Hungary, and short stay here will surely refresh your senses. Try to avoid weekends and late afternoons, it can get crowded. The Museum of Transportation is for those, who just love old steam engines, aircraft and classic cars. The museum’s collection is quite rich and has special models from Hungary and neighboring countries. There are many famous vehicles you never knew to be Hungarian. At the moment, the museum is under reconstruction so check the website before visiting. By now you can see that taking a beer bike in Budapest will get you to many amazing places and keep you and your friends entertained and boozed for days. If you’re ready for the experience, visit our site and book your beer bike tour today!